My friend and I love to quest together and have a blast. As you can see in this image I get to see some very fun things, while I ride her mount. I\ll be laughing so hard which makes questing even more fun. Wizard101 is all about fun and we take advantage of it every chance we get. Create an friendship card with your friends. How would you show you and your friends playing Wizard101? * Take a screenshot in game and make a friendship card to show how you and your friends play. * This contest begins February 8, 2017 and ends February 14, 2017 at 2:00 pm Central time. * Create your friendship card how ever you like, by using paint, gimp or any other format. You must use a screenshot though. 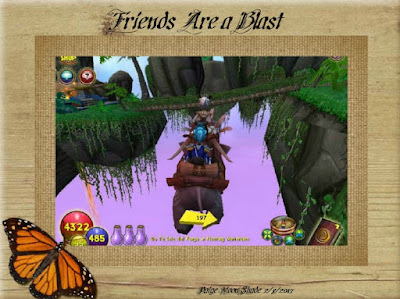 * Write a one paragraph about your screenshot..
* Send your entry to to ContestPaigesPage@gmail.com with title "Wizard101 Friendship Card." Thank you Paige for this contest! It was so much fun to do it with my best friend!